Put hydrogen peroxide on a cloth and rub the stain until disappears. 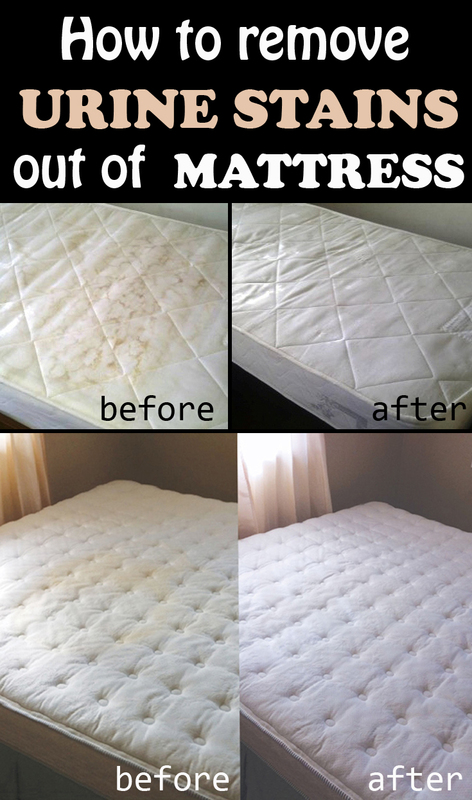 After that, thoroughly dry the mattress. – Prepare a solution of vinegar and water (half vinegar, half water) and apply half of glass over the stain (50-60 ml). Wipe the area using another dry cloth to absorb the entire solution. – Add one or two tablespoons of baking soda over the stain. – Mix a teaspoon of hydrogen peroxide with a teaspoon of dishwashing liquid and detergent in a container, apply baking soda powder over the mixture and homogenize it. Wait 15 minutes. – Wipe up the stained area until you remove all the substances used. – Make sure that the area is completely dry. 3. For the following solution you need hydrogen peroxide, baking soda, liquid dish detergent, 1 measuring cup, spoon, a funnel and a spray bottle. Mix 237 ml oxygenated water, 3 tablespoons of baking soda and a drop of dishwashing liquid detergent in a spray bottle. Use the mixture immediately because the products used are active for a short time (max 20 minutes). You should see the stain disappears in 5-10 minutes. Make sure the mattress is completely dry. After drying your mat, make sure no baking soda remains on it. If dust remains on the surface, simply wipe or vacuum it.